Abraham Lincoln High School, usually referred to simply as Lincoln High School, is a secondary school located in the Lincoln Heights district of Los Angeles, California, United States. It is located in the East Los Angeles-area community, surrounded by El Sereno, Chinatown, Boyle Heights and Cypress Park. The school is named after Abraham Lincoln, the 16th President of the United States, and is one of the first public high schools established in California. It is one of the District 5 high schools in the Los Angeles Unified School District, the second largest school district in the nation. Lincoln students are drawn from Chinatown and other areas. Cypress Park residents may attend either Lincoln or Franklin high school. 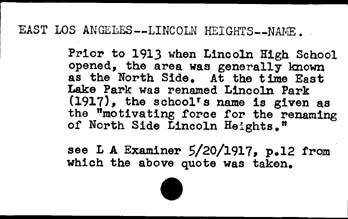 The early history of Lincoln High School is unusually complicated because it was founded in 1878 as Avenue 21 Grammar School. By 1913, the Avenue 21 school had become an intermediate school and its student population had grown to the point that a new campus was needed. That year the intermediate school moved to the present Lincoln High School site, and the curriculum expanded to include the senior high school grades. This marks the true beginning of Lincoln High. Pending the construction of a new school (the current site) on the former mansion property of Charles Woolwine, the Avenue 21 intermediate school moved its location to the hillside site (now the current physical education and track field), where students studied under the trees. Through the early 1970s, students from all six upper grades attended the school together. In 1878, the plant was extended across Lincoln Park (Los Angeles) Avenue, which is now the current site. In 1881, the school added a gymnasium; forty-three years later, in 1924, a science building was added. The present school was built extensively in the 1940s under President Franklin D. Roosevelt under his Works Progress Administration reform. Much of the construction and renovations occurred after the 1933 Long Beach earthquake, which damaged the gymnasium, the auditorium, the music building, the library, and the English building. Jim Tunney Stadium, home to Lincoln's football and track teams, was built during the reconstruction of Lincoln High School. Beginning in the latter part of the 1960s, Lincoln High School became a focal point for the emerging Chicano civil rights movement that was fueled by student activism which called for a more culturally sensitive educational curriculum and access to college preparatory courses for Mexican American students. Encouraged by Sal Castro, who championed equal educational opportunity as a Lincoln High faculty member, students at Lincoln organized a mass walk-out in protest of sub-standard facilities, vocational program tracking for Chicano youth and discriminatory practices which excluded them from advanced college prep courses. In March 1968, Lincoln High students led the first wave of what became the largest student strike in the history of public education in U.S. The "Blow-out" was joined by students from at least three other area high schools, among them Garfield, Roosevelt, Lincoln, Belmont and Wilson. In 2009 the opening of the Felicitas and Gonzalo Mendez Learning Centers relieved Lincoln. In 2015, Lincoln High School's baseball team won the CIF Los Angeles City Section Division II baseball championship. They defeated Cesar Chavez High School of San Fernando by the score of 3-0 in a game played at Dodger Stadium. It was the school's second baseball championship, and the first one since 1935. Lincoln is mainly made up of a large Hispanic and Asian student body, though there is also an even smaller African-American and White student population. In 2008, Lincoln is ranked as the 900th best high school in the nation in the Challenge Index. Lincoln High School's Magnet program was established in 1999. The Magnet program has a maximum of 226 students, ranging from grade levels 9 to 12. The program offers various opportunities for students to participate in courses and activities with emphasis on science, math, and technology. Lincoln has a Science Bowl team that has been running for fifteen years. Lincoln has two teams with 5 students in each team. Competing students must have a knowledge base in the following subjects: astronomy, biology, chemistry, math, physics and general science. Science Bowl utilizes a buzzer system, in which students must buzz in and wait to be recognized by a moderator before proceeding to answer a question. Lincoln has consistently scored in the top five in the Regional Science Bowl competition. Lincoln maintains an Academic Decathlon program for its students. Competing students in the program are placed into either one of three teams based on their skill level: Varsity, Scholastic, and Honors. The program covers the following subjects: language & literature, economics, art, music, mathematics, social science, and science. In addition, students are also required to write essays, participate in interviews, give speeches, as well as taking part in a Super Quiz - which focuses on a selected subject determined by the United States Academic Decathlon each year. Formed in 2008, Lincoln is one of the 15 schools that are a part of the Los Angeles Metropolitan Debate League (LAMDL). LAMDL is one of the networks of Urban Debate Leagues, that promotes debate for many urban high schools. In 2009, the Los Angeles Urban Debate League (as it was previously known) merged with a USC’s Neighborhood Debate League, creating what LAMDL is today. Lincoln has a highly successful policy debate team, competing and winning major tournaments both locally and nationally. Lincoln has won some of the most prestigious tournaments in California, including the California State Invitational held at the University of California Berkeley as well as the Pepperdine Invitational Debates, and clearing into eliminations in tournaments like USC’s 'David Damus' Trojan Championships. In 2009, Lincoln won 4 out of the 6 local tournaments, winning City Championships, and in 2010, won 5 out of the 6 local tournaments. In 2009, Lincoln debated at the Chase Urban Debate Nationals, held in Chicago, and returned to Nationals again in 2010, clearing into eliminations, and Nationals again in 2011, placing 5th overall. API for Lincoln High School. A majority of the students come from Florence Nightingale Middle School, El Sereno Middle School. Abraham Lincoln High School has a competitive rivalry against Wilson High School. Eldridge Cleaver, writer - "Soul on Ice"
Abraham Lincoln High School briefly appears in the end of the movie Walkout (film) (a real life video in the end credits). ^ "Abraham Lincoln Senior High". National Center for Education Statistics. Retrieved December 17, 2018. ^ "Abraham Lincoln High School Alumni Association". Retrieved 9 May 2016. ^ Hill, Copyright 2016 The University of North Carolina at Chapel. "UNC Press - Blowout!". uncpress.unc.edu. Retrieved 2016-11-12. ^ "2. Proposed Changes to Lincoln High School Area Schools, School Year 2009-2010." Los Angeles Unified School District. Retrieved on March 17, 2010. ^ "Challenge Index". Washington Post. Archived from the original on 2013-01-29. Retrieved 2007-05-06. ^ "2007 Base API County List of Schools - LOS ANGELES County". 2017-10-08. Archived from the original on 2017-10-08. ^ "Justices - supreme_court". 2016-06-17. Archived from the original on 2016-06-17.